Whether a foodie or not, one fact that everyone will agree with is how the mention of Tandoori food often goes hand in hand with non-vegetarian preparations. 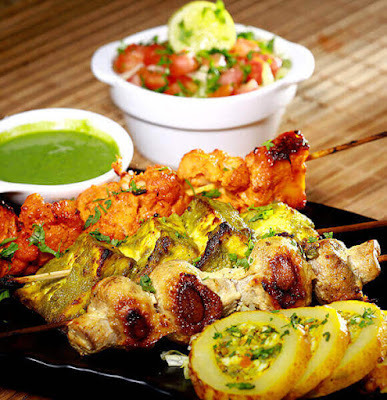 The perception that 'mood to have Tandoori food' inadvertently means the craving to devour some succulent non-vegetarian preparations like different types of Chicken Tikkas, Tandoori Seafood Platter and the likes, needs to be changed as there are a couple of misconceptions with regards to Tandoori food. Contrary to popular belief that Tandoori food is a type of cuisine à la Chinese, Italian, or North Indian cuisines, the fact remains that it actually is a style of preparation wherein the food is cooked in a hot clay oven. It is the style of cooking the food in different types of these tandoors that renders the food that typical and unique grilled and smoky flavour. Another myth to be busted here that Tandoor preparations are not just limited to various types of bread or rotis and meats. You can toss together all the ingredients for the marinade which imparts the actual taste to the main dish and follow it up with the other ingredients to make the dish of your choice, which may not necessarily be a meat or fish preparation. It may sound delusional to many but vegetarian kebabs do exist and once served to you, you will surely be bowled over by the sheer deliciousness of these. What is interesting to note here is that just like its non-vegetarian counterpart, vegetarian kebabs do come in a deluge of varieties. Read on to find out the best vegetarian tandoori preparations that many Tandoori restaurants in Mumbai are popularly known for. 1. Corn Kebab: This is one preparation that you can have on the menu as a starter for your next dinner. It is quite popular among children and the innovative plating itself is enough to have you indulge in the crispy delicacy. Sweetcorn dominates the preparation along with potatoes while green peas is an optional ingredient but is commonly found. The best part of the preparation is its non-oily nature due to the chosen grilled method of cooking. Tangy Pudina chutney makes for the best accompaniment of this exciting vegetarian Kebab that can give the good old Fish tikka a serious competition. 2. Tandoori Tofu: A great substitute for the good old Paneer, Tofu is quite popular among foodies. More so because of its nutritional value. Made from soymilk, Tofu has great health benefits with its high iron, protein and low fat content. Giving the classic Tandoori Paneer a break, try the Tandoori Tofu instead which is high on taste as well as bears many a health benefit too for you. Served on skewers and plated very interestingly, this dish will leave you impressed at the word go. The rich gold hue of the turmeric peeping through the deep sunset orange tint from the grill makes quite an Instgrammable impression. The thought that food is consumed by all the senses holds quite true in this context as the aroma from the grilled preparation build your appetite, the platter served in front of you is quite a visual and finally the taste of the rich spices in the creamy marinade satiate all your cravings. It is time for you to try this one! 3. Veg Seekh Kebab: Yes, you read that right! A dish called veg Seekh Kebab does exist and does complete justice to its name, just like its succulent non-vegetarian cousin. The best part of these vegetarian Kebabs is unlike the chicken or mutton Seekh Kebabs, the vegetarian one can be prepared using diverse combinations of ingredients and is not limited to just a couple of vegetables that can be used for the preparation. A combination of potatoes, cabbage, carrots, french beans and green peas is among the favourite ones liked by many a food lover. The delightful golden-brown colour of the tandoor preparation plated with finesse is just what you need to sate your hunger pangs. Dips like Pudina chutney and yoghurt garlic sauce add a distinct flavour to these scrumptious kebabs. 4. Mushroom Tikka Kebab: Whoever said that Paneer is all there is to vegetarian food has definitely never given vegetarian food a fair chance and made a judgment just too soon. The Mushroom Tikka Kebab is one example of just how palatable and tempting a vegetarian dish can be. The extremely nutritious and delicious mushrooms are grilled with Bengal gram flour and some of the choicest spices and condiments which make it the perfect preparation for snacks. So the next time you head to one of the Tandoori restaurants Mumbai has, steer away from your usual non-vegetarian Tandoori orders and experiment a little with the recipes mentioned above and you will be pleasantly surprised by how toothsome vegetarian Tandoori preparations are.